WOW, what a week!!!!! In my story last week I said that this year’s Cattlemen’s Days would be one of the best ever. I didn’t miss my prediction what so ever. It all started for my wife and me last Wednesday night when we went to the Pioneer Museum and Historical Society Annual Banquet. When C.J. called our meeting to order our first surprise was not even on the program. Karen Cummins sang the Star Spangled Banner without an accompanist, the performance was magnificent. Next Peter Dunda played on his accordion all of the American Military songs and as he played each song he had all of the Service Men and Women stand up. As each song was played you could see the PRIDE and JOY of all the people at the banquet, they clapped their hands and sang the songs with pride. It didn’t make any difference of age you could tell they were very proud to be Americans. Thank you C.J. Miller for putting on such a great evening. I know that everybody enjoyed it. Thursday night we went to the Cattlemen’s Days Rodeo. Hundreds of people of all ages filled into grand stands to see the rodeo. During the Grand Entry They also played all of the American Military songs and ask all of the service men and women to stand up during their song. The people in attendance of the rodeo clapped their hands and sang the songs and showed their respect to the past and present service people in attendance. The people in attendance showed their pride for America. The “Specialty Act” with the longhorn steers was something to see as we sat there in awe! While waiting to see what the lady and her horse would get the steers to do. They jumped onto a flatbed truck pulling a large stock trailer and then climbed onto the top of the trailer and waited for the woman on the horse to come to the top of the trailer the same way that the steers did. The rodeo was one of the best that I have attended in Gunnison. Gene Hollenbeck and the Gunnison County Cattlemen’s Day Committee did a great job and should be very proud of the show that they brought to Gunnison. The members of the Pioneer Museum are very proud of our museum and of our displays. 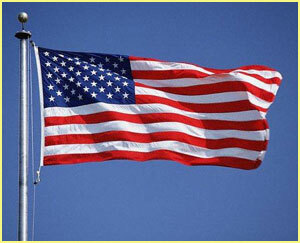 We have American Flags from the original Thirteen Star thru 50 star flag. In the Jordan Building you will find uniforms our service men and women wore while in the military. We have a complete uniform that was worn by Sergeant Cass Leonard during World War II. These range from World War I thru Desert Storm. There are rifles from as early as World War I, you will find sleeping equipment and eating plates, knives and forks that was used overseas. In the D.A.R. Building you will find a Thirteen Star American Flag on display. In the upstairs of the Main Building at the museum, you will find a very nice arrowhead collection consisting of 25 arrows, donated by the Estate of Donald Davis. We have more Arrowheads in the Vulcan Building. Bill and Judy Sunderlin donated several different collection of arrowheads. The first is a collection of 15 arrowheads that are in an ornately carved (with flowers) wooden frame. This wooden frame was made by Y.A. “Hogermite” Tuttle at the Tex Lodge Resort, Iola, Colorado. There are arrowheads collected by Bob Sunderlin in the Kesar Basin Camp site in the 1960’s. The next collection of many arrowheads in a reddish brown frame with rope liner, donated by Bill and Judy Sunderlin. The last collection was also donated by Bill and Judy Sunderlin. The arrowheads are placed in a window frame with four divisions. The frame came from the Hunt-McClaugham house in Lake City, Colorado. At the banquet last week I had several people ask me why I wasn’t identifying myself as the writer of the museum articles. There is a good and bad side about signing your name to articles of this kind. The bad side about signing is if you write something that somebody doesn’t like they know who to contact and they can complain to you about it. The good thing about signing if you write something good that the readers like, they can also express their compliments to you. 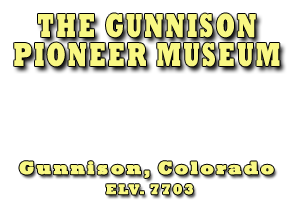 Please remember the Gunnison Museum and Historical Society are always looking for new members. If you come to see the museum and you like what you see, JOIN and help us make it better.